A field in the Russian Far East after a forest fire. Due to the location of the trees, the concentration of charcoal differs from place to place. Credit: Bryanin S.V. Boreal forests are a huge carbon sink. The fine roots, not only the leaves, stems and branches of trees, largely contribute to carbon accumulation. The Russian Far East has had an increasing number of forest fires, many of which are believed to be caused by global warming and human activities. Burning trees in forest fires naturally cause the emission of CO2, but little is known about the extent to which fire-derived charcoal influences ecosystem processes, such as soil organic matter decomposition. The researchers, including Russian Academy of Science Senior Researcher Semyon Bryanin and Hokkaido University Assistant Professor Makoto Kobayashi, performed field litterbag experiments over 515 days, incubating fine larch roots with varying concentrations of charcoal in the soil. Mass loss of fine roots was measured in each of four conditions over nearly two years: control (no charcoal); mean charcoal content measured in the field; twice the mean charcoal content measured in the field; and charcoal content equal to the maximum concentration in the field. According to the results, charcoal had little effect on the decomposition of fine roots right after they were buried in soil. But at the end of the experiment, the loss of root mass in samples incubated with higher concentrations of charcoal was greater (double content: 40 percent; maximum content: 42 percent) than in the control (30 percent) and the average content conditions (27 percent). 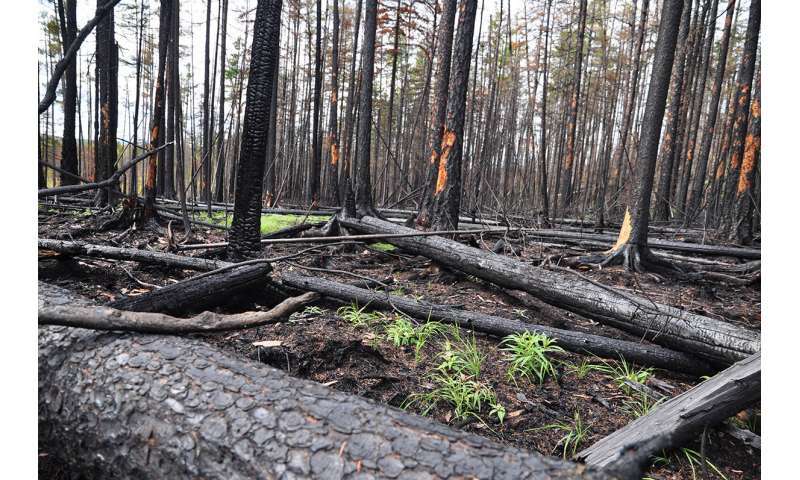 "Our study has provided the first field evidence that fire-derived charcoal might accelerate the decomposition of fine larch roots and consequently CO2 emissions from boreal forest," says Makoto Kobayashi. The finding likely will help predict future changes in CO2 concentration in the atmosphere should more forest fires be triggered by global warming and human activities. Yet the charcoal is a carbon sink, because micro-organisms can't eat plain carbon - they're eating the ligning and cellulose. Leaving old trees to rot releases CO2 and methane, whereas the burnt and charred wood breaks down without composting and the carbon is sequestered. Trying to prevent forest fires in order to keep the biomass is missing the point, as the forest will only grow so much before it stops taking in more CO2. It has to burn occasionally to bury the old biomass, and grow new trees on top.